This DTC is stored when LIN communication from the certification ECU stops for a certain amount of time. 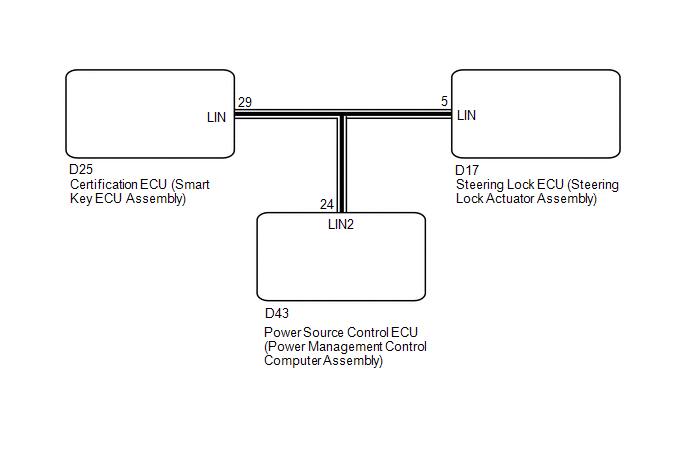 Errors in LIN communication between the ECUs or an open or short in communication lines. LIN communication from the certification ECU (smart key ECU assembly) stops for a certain amount of time or more. (a) Disconnect the D25, D43 and D17 ECU connectors. (a) Reconnect the D25 and D43 ECU connectors. (a) Reconnect the D17 ECU connector. (b) Disconnect the D43 ECU connector.